I think this piece of news might be of interest to many. Just minutes down from my office is Jaya Shopping Centre. About sometime ago, CIMB-Mapletree bought the old building and planned to demolish and rebuild a brand new Jaya Shopping Centre. We failed in our bid for this contract though. Anyways, something terribly big happened today. As I was already out of the office that time, I did not get to see the incident directly - instead, I surfed on TheStar.com.my and checked out the photos though. The demolition works gone awry. 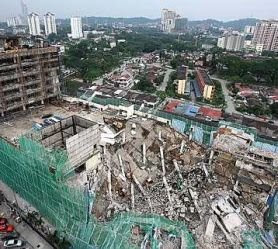 Part of the four storey podium had collapsed midway through its demolition - and together with it, trapped a number of Indonesian workers underneath. There arent much updates thus far; I guess I'll take some photos from my office tomoro and post up the photos later. What's the prospect of the construction industry going forward? R U dependent on the government sector to get projects. If not then how many % of ur jobs r from government sector? Do refer my reply in my following post.